Take a look at the list of houses, condos, and apartments for rent in Guam in real time on Guam House Finder. 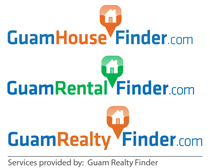 All listings for Guam houses for rent in the Multiple Listing Service are on Guam House Finder. Filter your search to quickly sort by type, village, price, and bedroom. Or if you need personal help finding the right home for you, contact us, and we would be happy to help you! Lets see the homes in person. After narrowing your search to a few potential homes, contact us to schedule a showing. Besides the actual home, it is important to find the right neighborhood and location that you would like to live in. Only then should you select your new Guam rental home. Once you find the right home for you, we will walk you through the rest, until you are settled in your new Guam Rental. We can help you make the move into a new home easy for everyone, including military personnel. Our team of REALTORS® are well experienced in the specific requirements of military(OHA, Military Clause, etc), so take the stress out of moving into your next Guam home with Guam House Finder, even before moving to Guam. Don’t worry about the fees, our services are all free for you. We make our money from commission paid by the landlords, so you can use the website and our personal service for free (that’s free of any fees). Please give us a try, find a Guam home the easy way!